With the widespread growth of cloud computing and mobile healthcare crowd sensing (MHCS), an increasing number of individuals are outsourcing their masses of bio-information in the cloud server to achieve convenient and efficient. In this environment, Cloud Data Center (CDC) needs to authenticate masses of information without revealing owners’ sensitive information. However, tremendous communication cost, storage space cost and checking time cost lead to CDC that give rise to all kinds of privacy concerns as well. To mitigate these issues, To mitigate these issues, we propose a data anonymous batch verification scheme for MHCS based on a certificateless double authentication preventing aggregate signature. The proposed scheme can authenticate all sensing bio-information in a privacy preserving way. 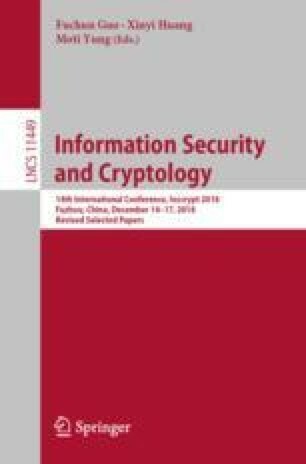 We then present that the proposed CL-DAPAS scheme is existentially unforgeable in the Random Oracle Model (ROM) assuming that Computational Diffie-Hellman problem is difficult to solve. Furthermore, we provide an implementation and evaluate performance of the proposed scheme and demonstrate that it achieves less efficient computational cost compared with some related schemes. The author would like to thank the anonymous reviewers for their constructive comments and suggestions. This work was supported by National Key R&D Program of China (2017YFB0802000), National Natural Science Foundation of China (61772326, 61572303, 61872229, 61802239), NSFC Research Fund for International Young Scientists (61750110528), National Cryptography Development Fund during the 13th Five-year Plan Period (MMJJ20170216, MMJJ201701304), Foundation of State Key Laboratory of Information Security (2017-MS-03), Fundamental Research Funds for the Central Universities(GK201702004, GK201803061, 2018CBLY006) and China Postdoctoral Science Foundation (2018M631121).